Okay, maybe that's an exaggeration, but not by much. 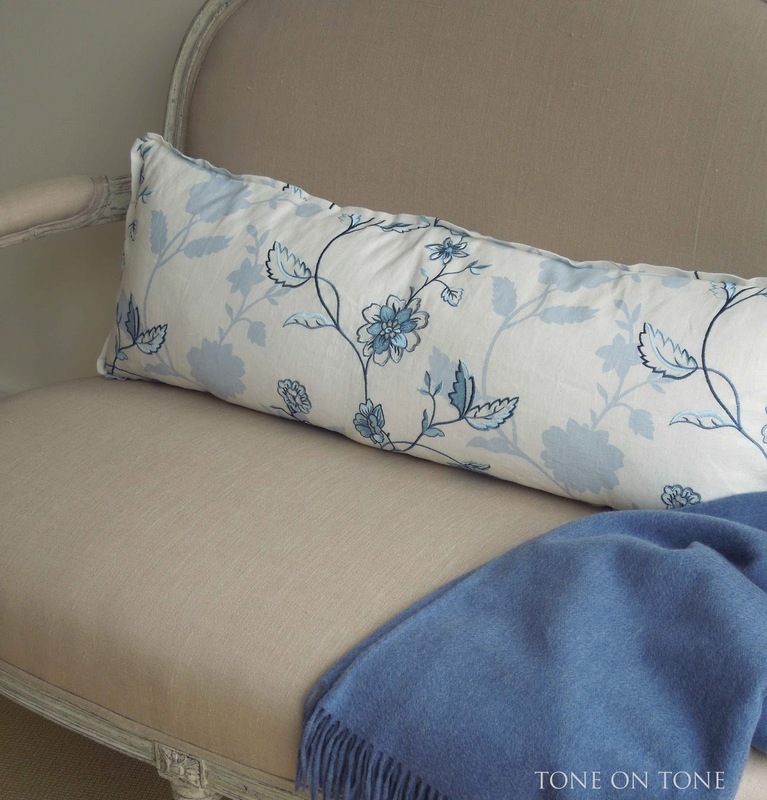 I had planned to visit and photograph a client's lovely home for this week's post. 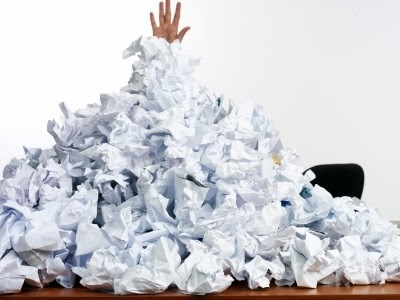 But, sadly, I've been buried under a mountain of paperwork. 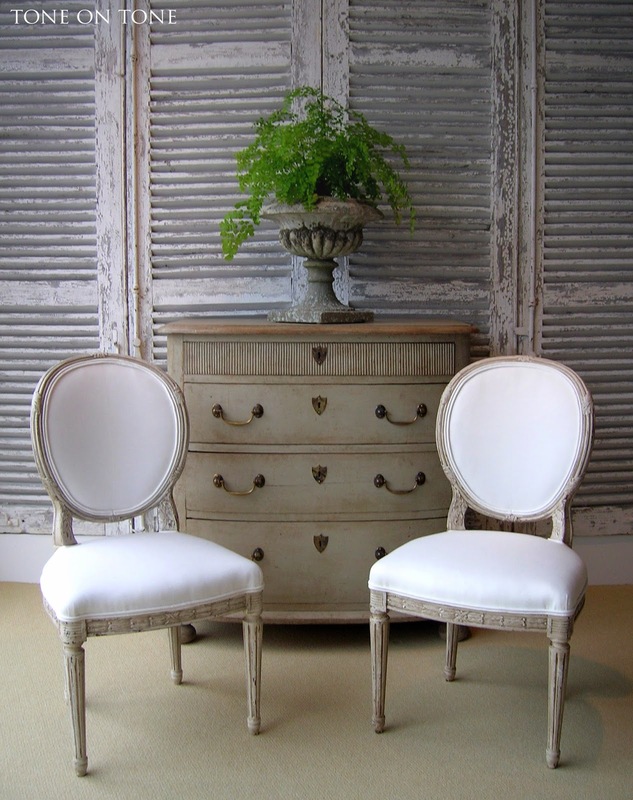 While I tackle the massive pile, enjoy a few favorite vignettes, past and present, from our shop. 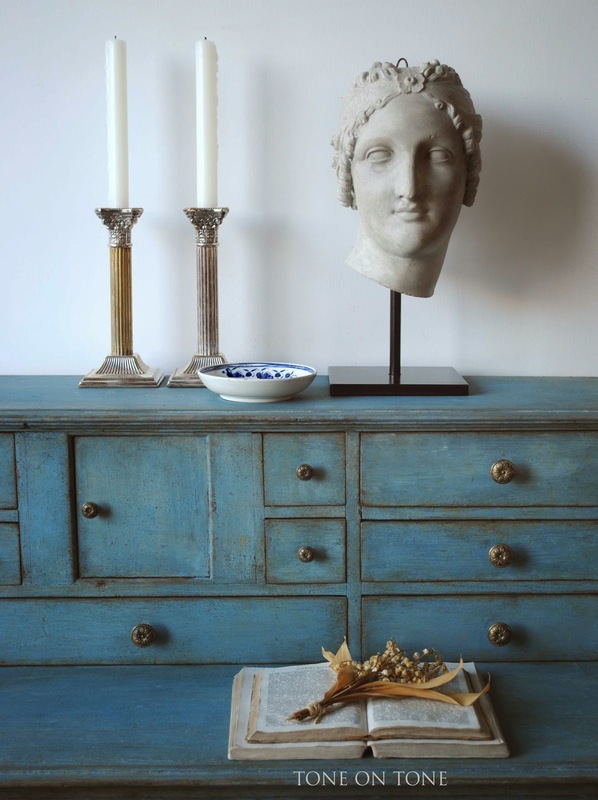 To me, these show the versatility of Swedish painted antique furniture. 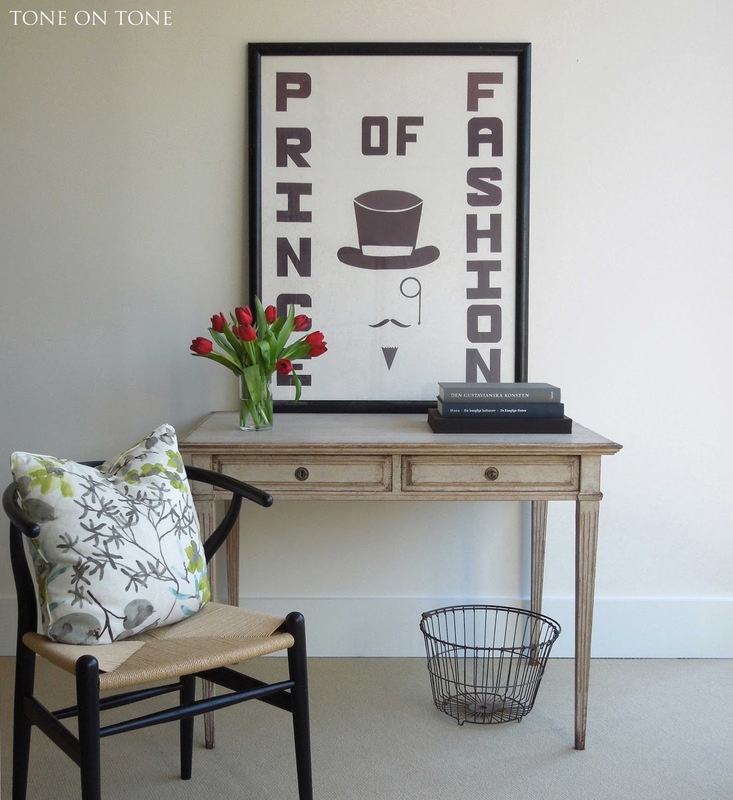 I know nothing about this vintage "prince of fashion" collage, except that I adore its personality. Kinda reminds me of the Monopoly man - right? 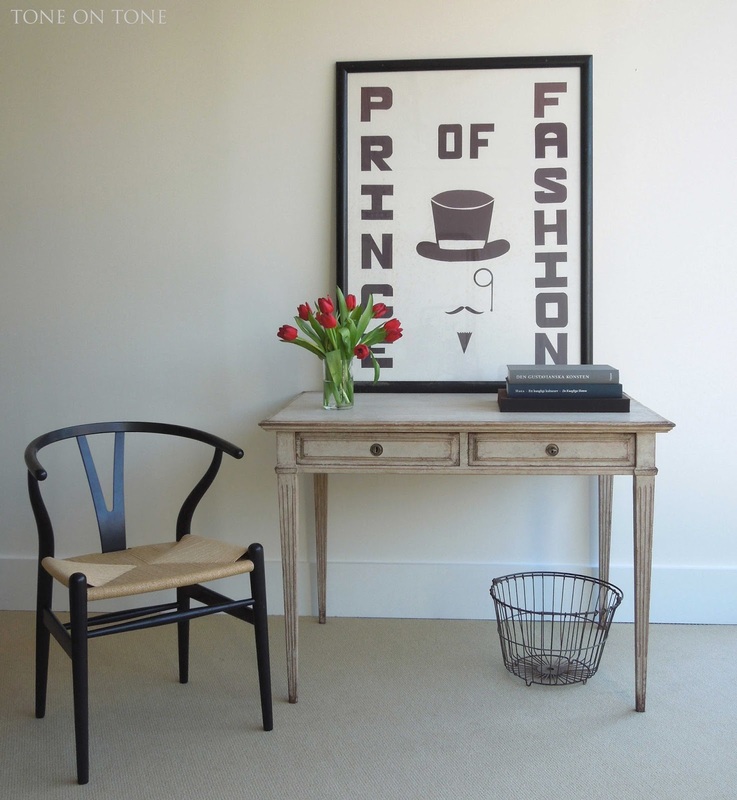 It looks really graphic with the Swedish Gustavian writing desk and mid-century Wishbone chair - all with very clean lines. 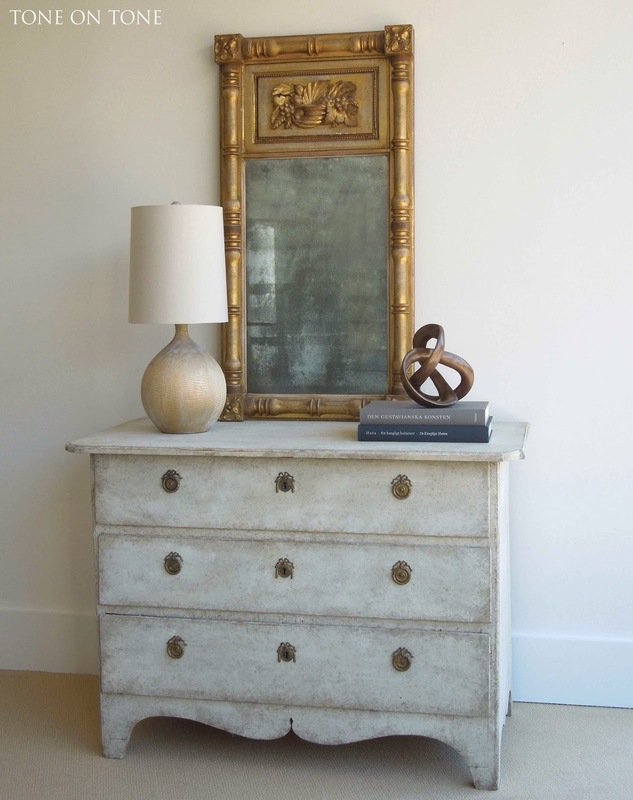 Here is a Swedish Rococo late 1700s chest paired with an American Federal 1800s giltwood mirror. 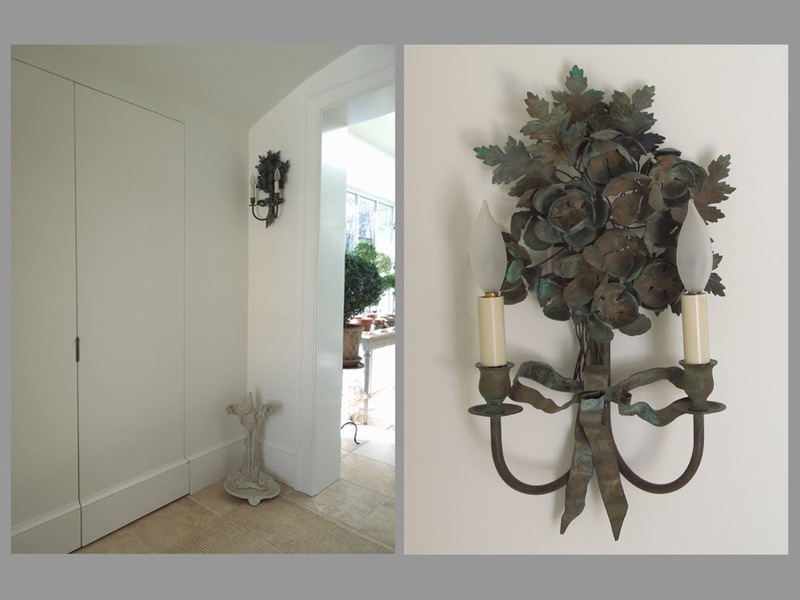 The gilded pottery lamp and brass knot sculpture are both contemporary. Notice the mirror's cornucopia detail and original mercury glass. I am really drawn to heavily foxed glass - the more worn the better! Pairing American and Swedish antiques again. 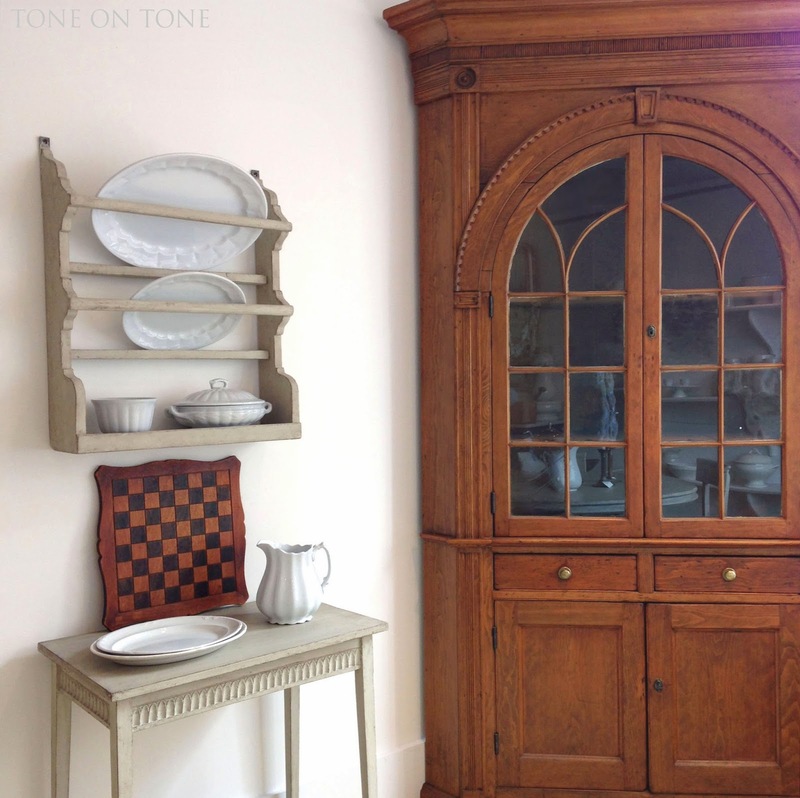 The Federal pine corner cabinet and game board are both American, while the plate rack and table are from Sweden. 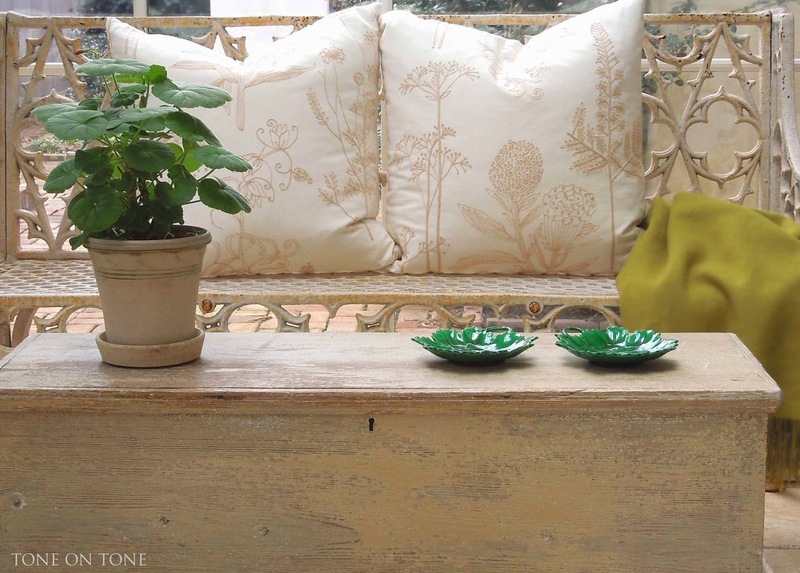 Above and below: Swedish painted pieces with French fruitwood furniture. 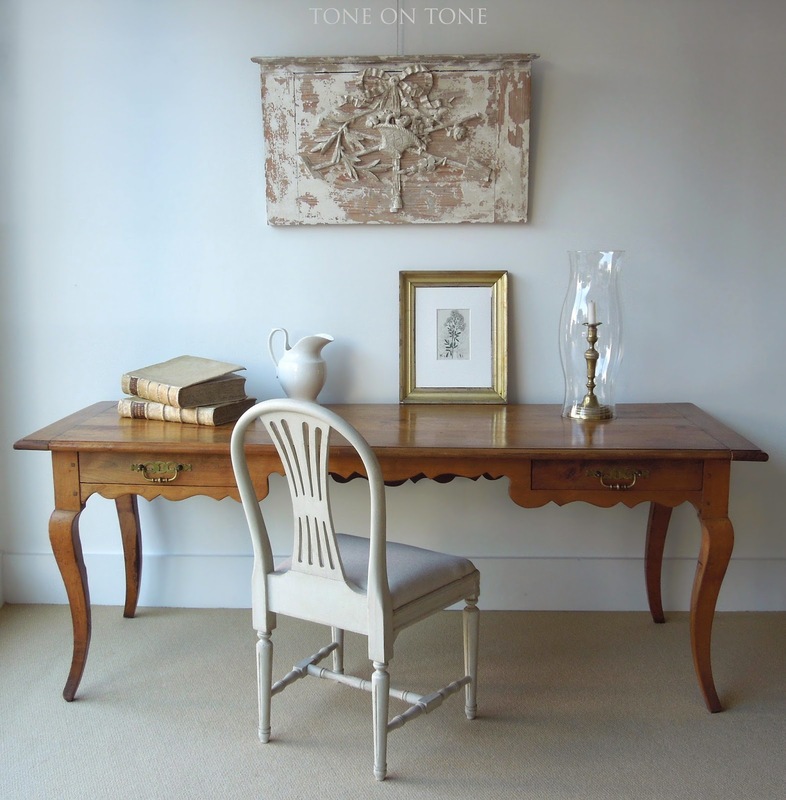 The 19th century Louis XV style desk is from Normandy. And the carved architectural wooden curtain, in early grey and salmon paint, is from a chateau's theater for children. Wouldn't it make a fabulous backdrop for a gallery wall or bed? 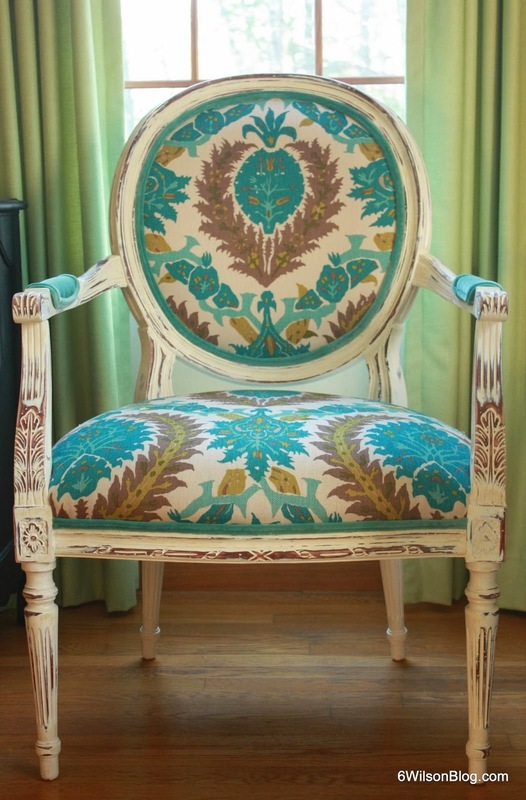 Swedish painted armchair with a mahogany work table. Though the finishes are quite different, their clean lines work well together. Mixing it up! 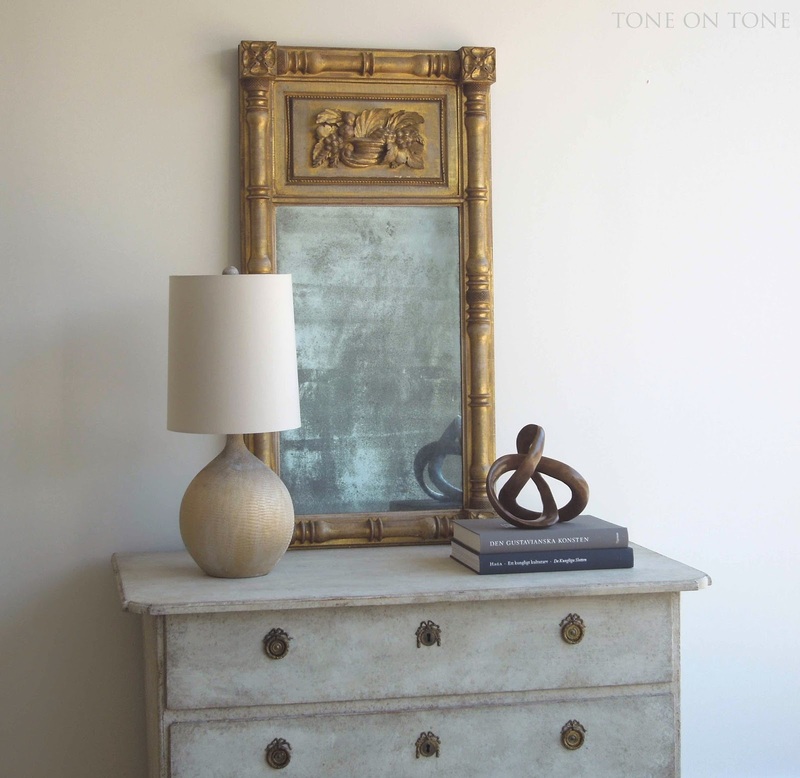 Two photos of former pieces at Tone on Tone. 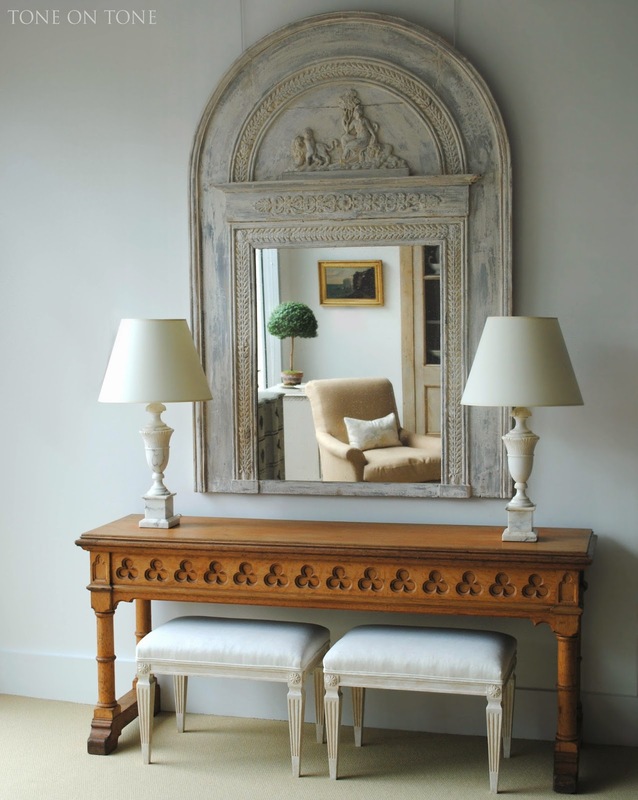 A French Empire trumeau mirror, Italian alabaster lamps, English Gothic oak console, and Swedish Gustavian stools all together. Classical touches below. Finally, a look at Swedish on Swedish. 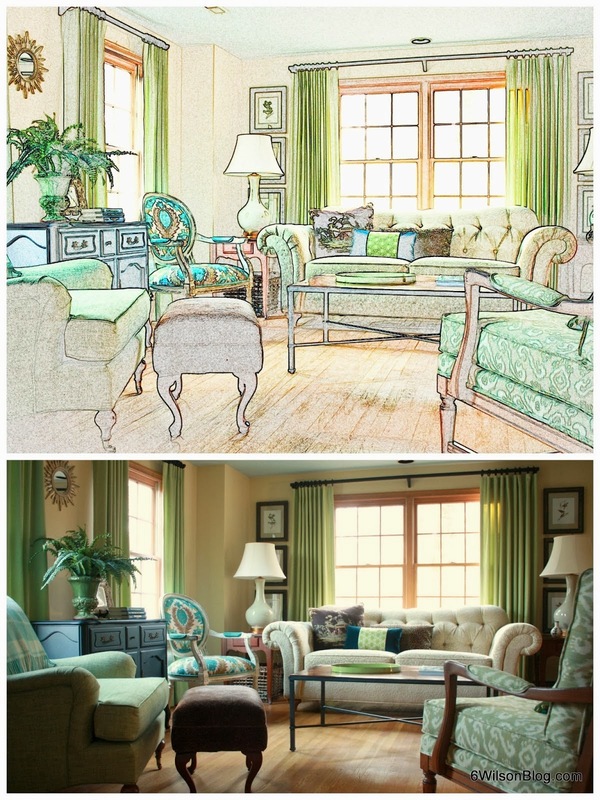 When layering painted furniture, it is important to still have contrast - brass, gilt, and crystal accents all help. Until next time - bye, now! 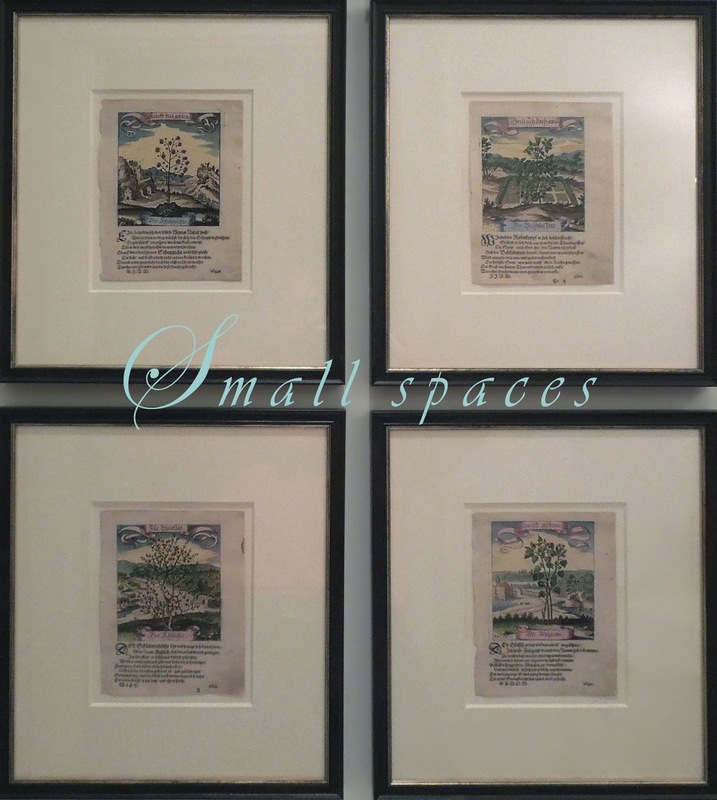 When it comes to small spaces, I choose to celebrate them! 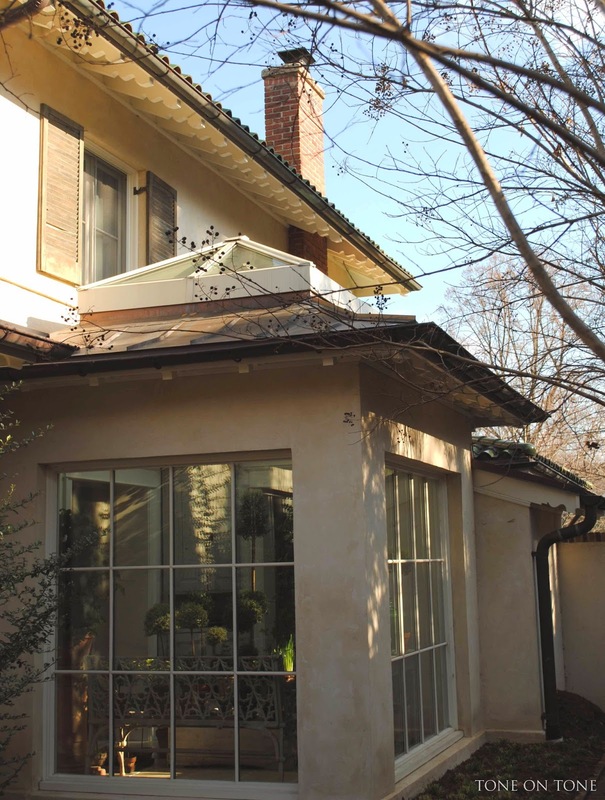 You see, I am quite fond of old houses and, because many of them come with little rooms, I consider these modest spaces an important part of the overall character. A home comprised entirely of tiny rooms might be challenging, but a few can be charming - even special if thoughtfully appointed. So let me share examples from our home. These rooms are decorated with function, flow, and aesthetics in mind. But first, it's my pleasure to announce the winner of the 6 Wilson pillow drawing chosen randomly at 10:00 PM on 2/15/14 via random.org. There were 144 entries, but three were duplicate / clarification comments. 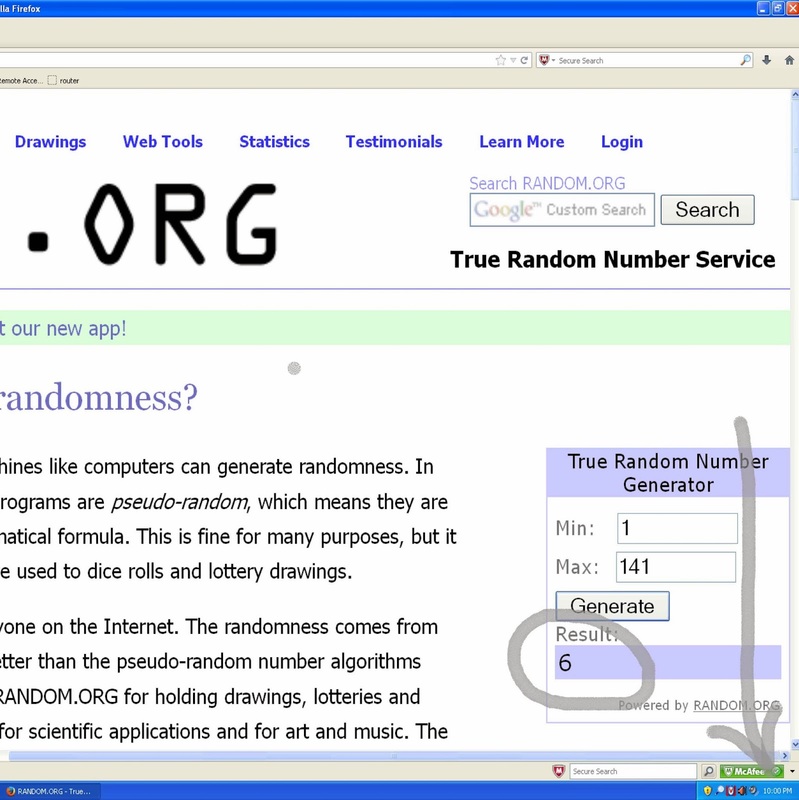 Congrats to anonymous comment #6 - Barbara P (pligko)! Carol will email you for shipping info. Many thanks to everyone for participating in this drawing. I hope you all will continue visiting 6 Wilson. I am especially grateful to Carol for her generosity! Guests are greeted in our 7' 4" x 6' 2" entry foyer located on the side. For reference, the average sofa is about 7' long. Originally, there wasn't a foyer as the front door, located in the center, opened ungraciously right into the living room. 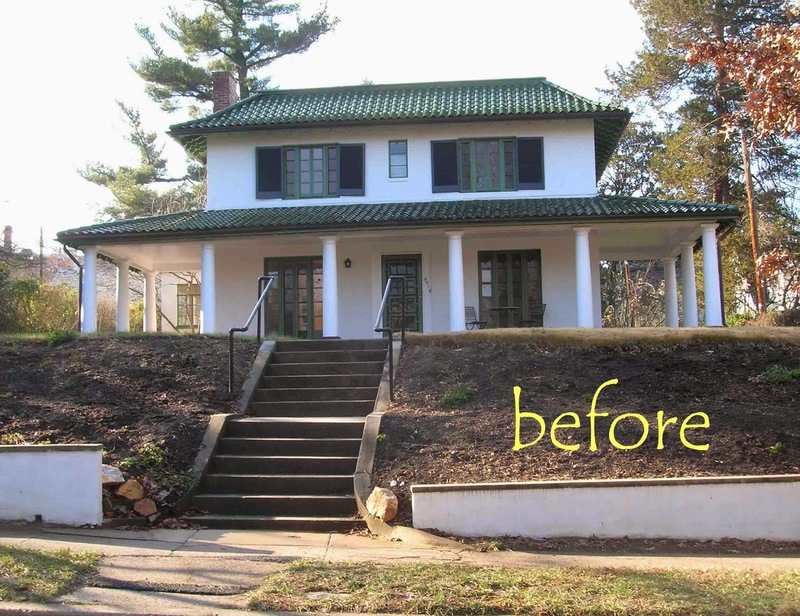 (See before photos below.) 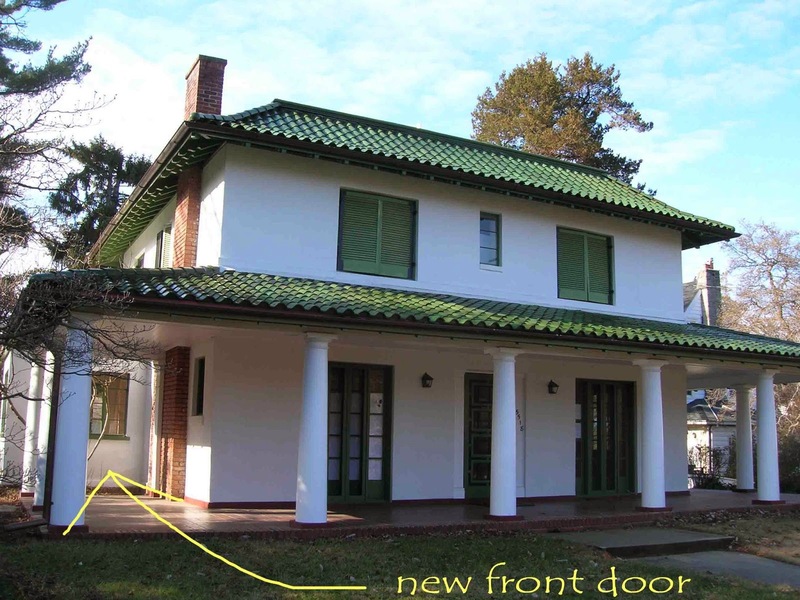 During the renovation, a portion of the wraparound porch was converted into the new entry vestibule. 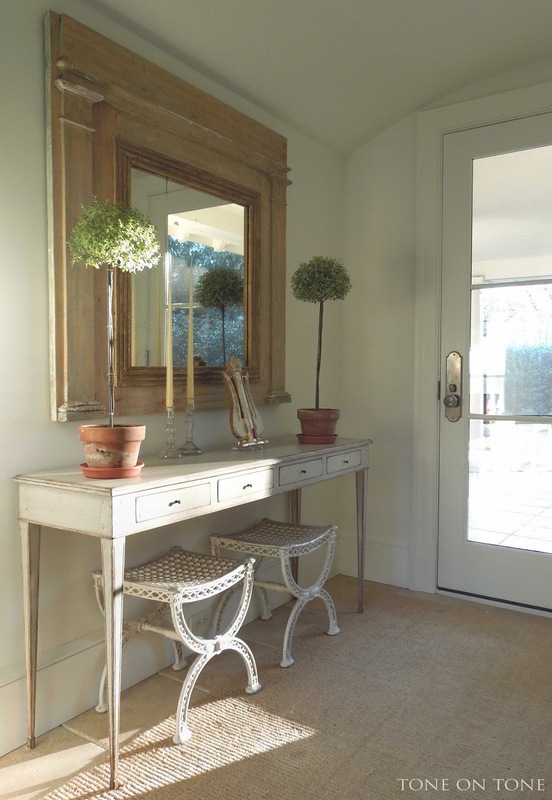 This simple foyer is furnished exclusively with antiques. The Swedish console is long, narrow, and airy. 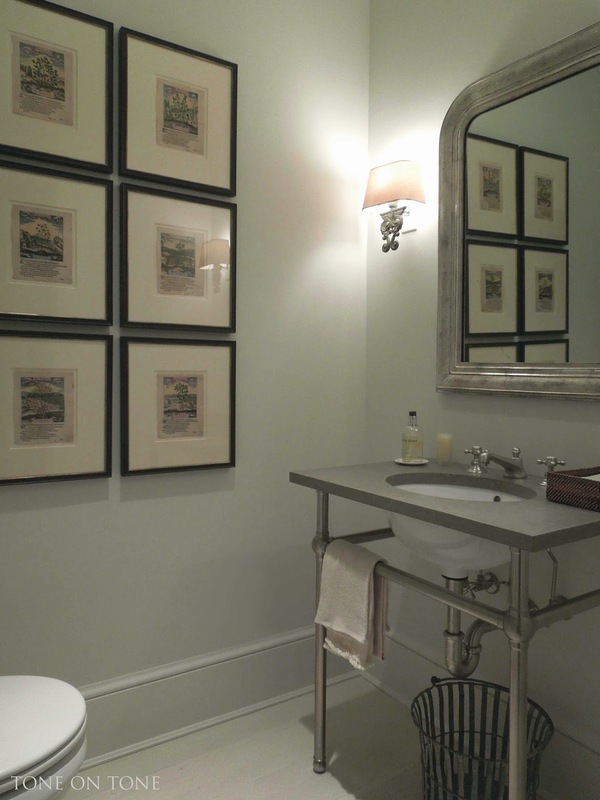 Its drawers are perfect for keys, gloves, etc., while the open legs allow the French iron stools to be tucked under. 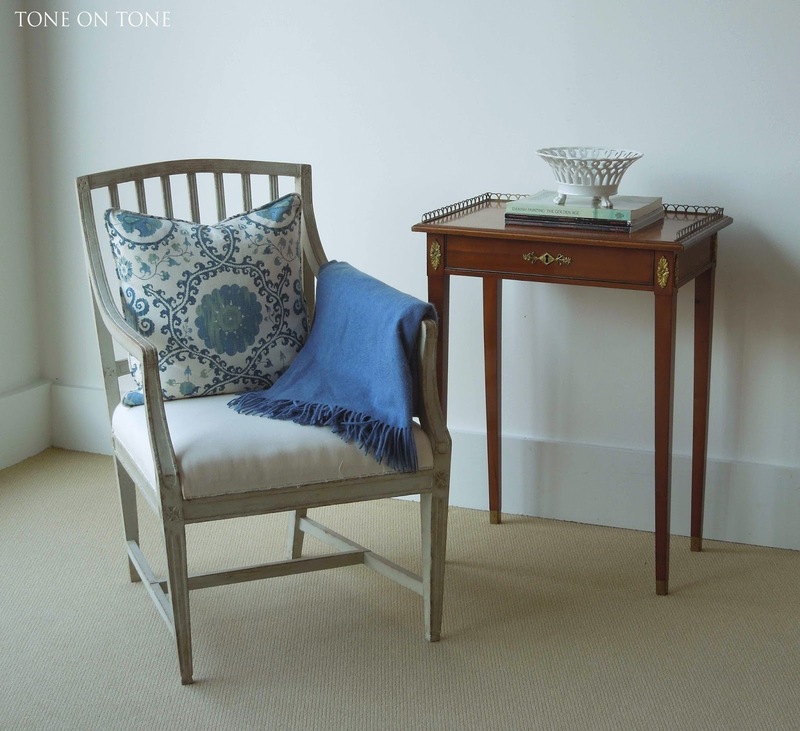 Not all the furniture in a small room should be undersized. One large statement piece can create an illusion of scale. 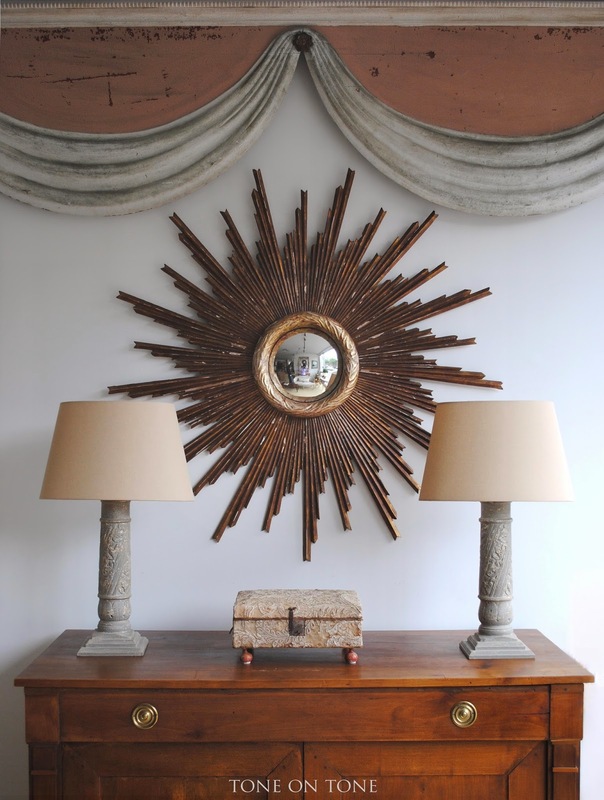 Here, I've chosen a French trumeau mirror to do just that. On the console is an early barometer. On the other side is the coat closet. Embellishing these doors would draw attention to their short stature, so I opted for molding-free jib doors with concealed hinges and sliver-thin pulls. 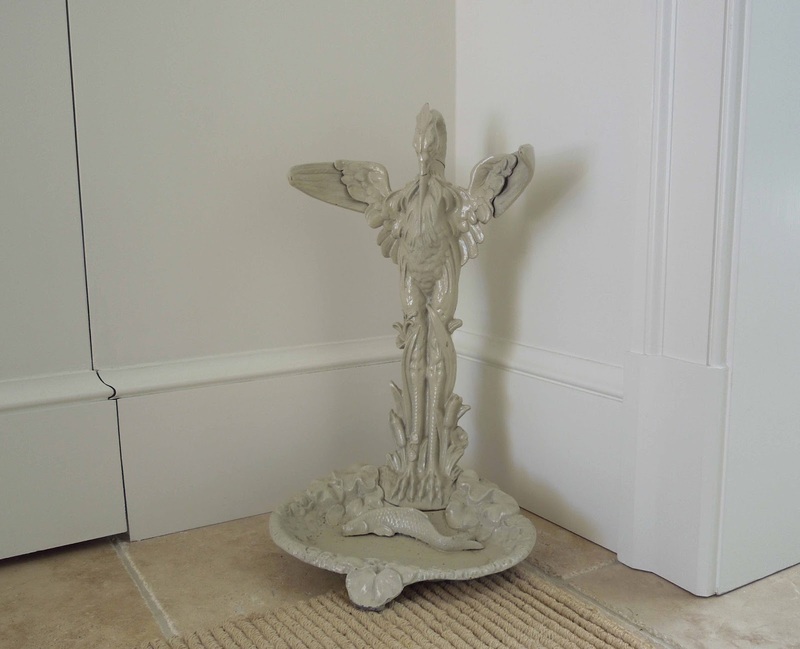 The tole sconces and iron umbrella stand are French from the early 1900s - imagine the fish "swimming in the water" from wet umbrellas. 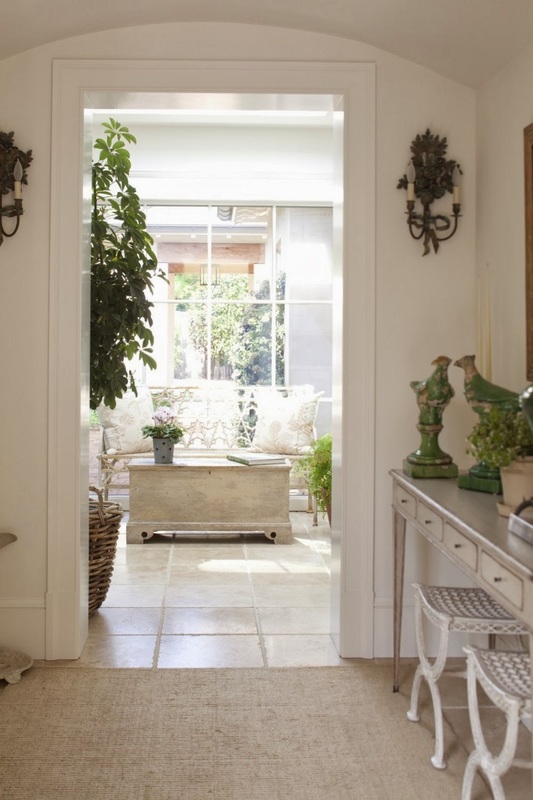 The entry leads into the 9' x 7' 8" conservatory, which was formerly a dated sunroom with partially glazed windows, terra-cotta tiles, and pine paneling. 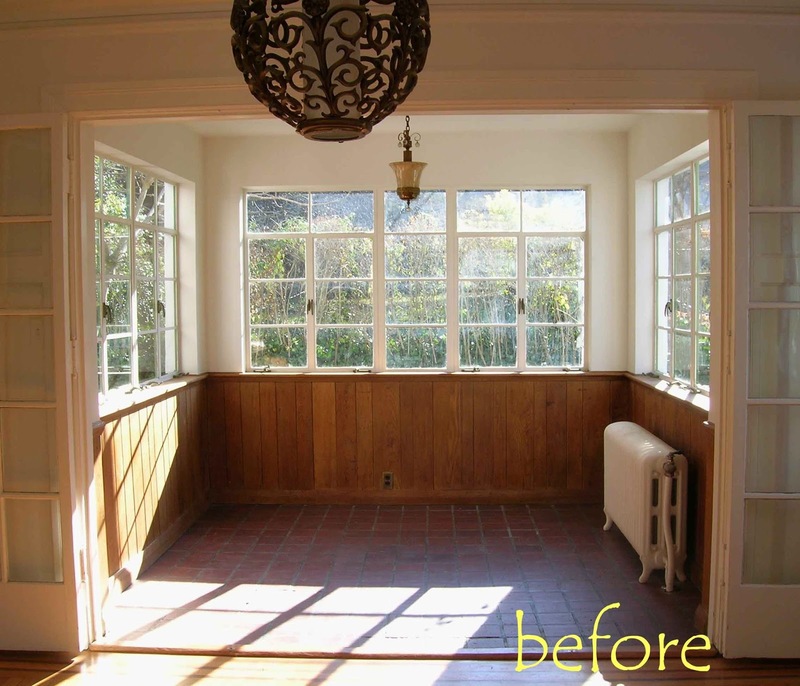 A large skylight, floor-to-ceiling windows, and limestone flooring completely changed this little room. 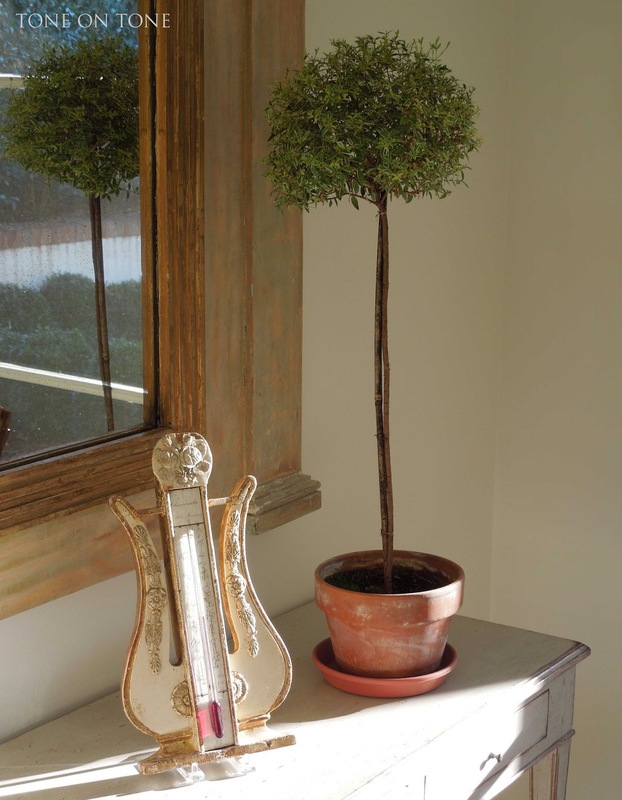 There are two sitting rooms directly off the conservatory, so I mainly use it to grow my beloved topiaries. What's this? 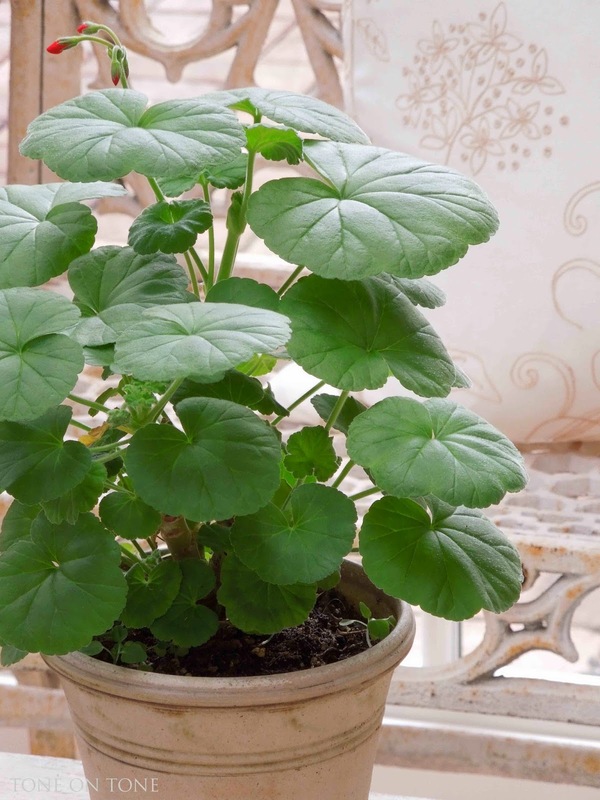 A red geranium?? 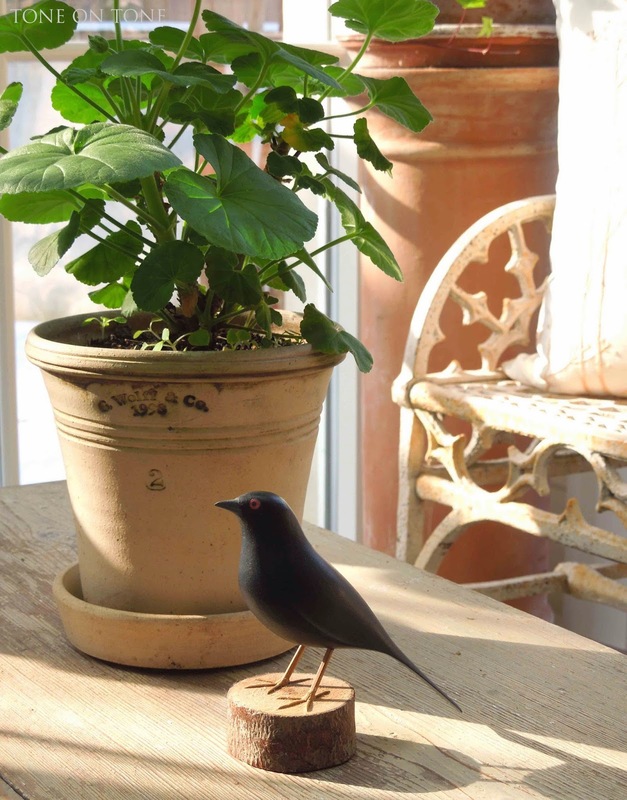 :) The blackbird is from a cute shop in Brooklyn, NY. Once again, I've furnished this room with smaller-scaled antiques such as the American Delaware blanket chest, French iron bench, and Swedish table. 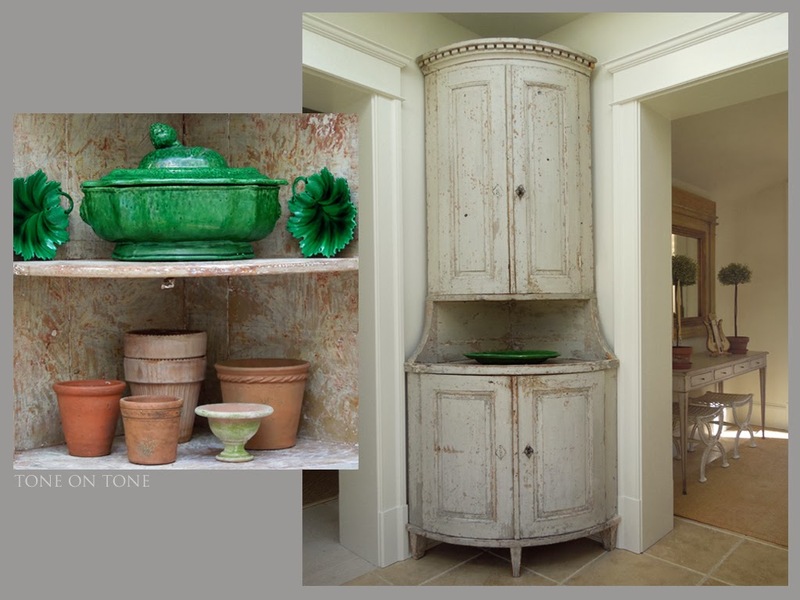 The exception is this tall Swedish Gustavian corner cabinet to take the eye up. 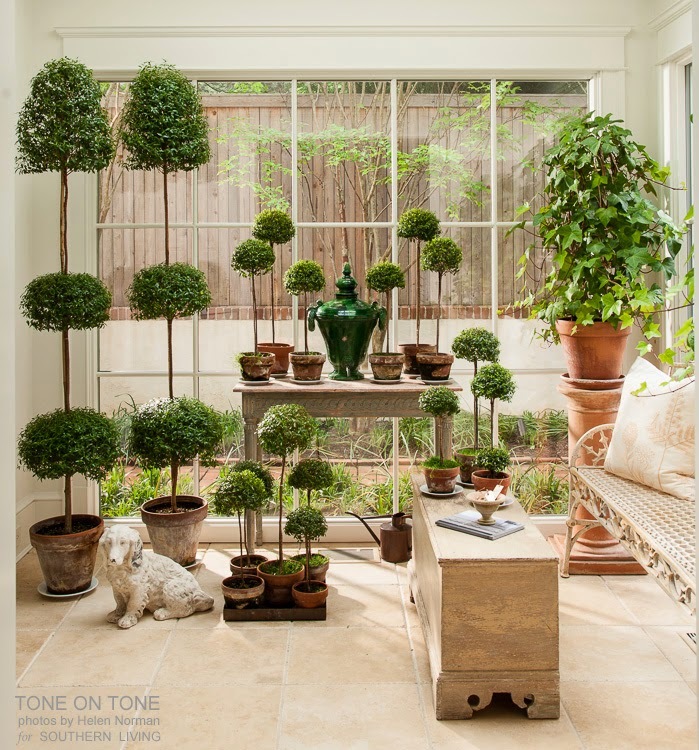 Even with all the furniture and plants, there is ample room to walk through. Please step inside our compact 4' 5" x 6' powder room. There is a pocket door, which I highly recommend for small spaces such as closets, bathrooms, etc. 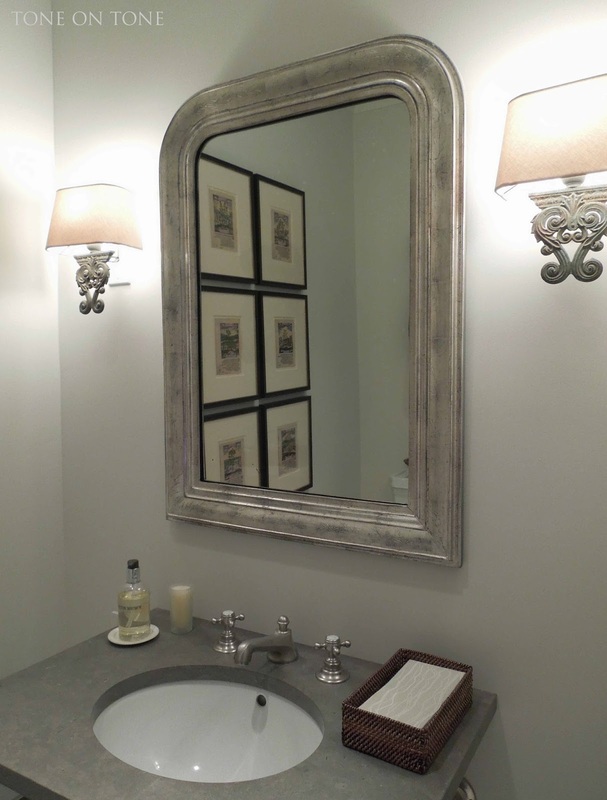 To not crowd the room, I chose an open-leg sink console from Waterworks. 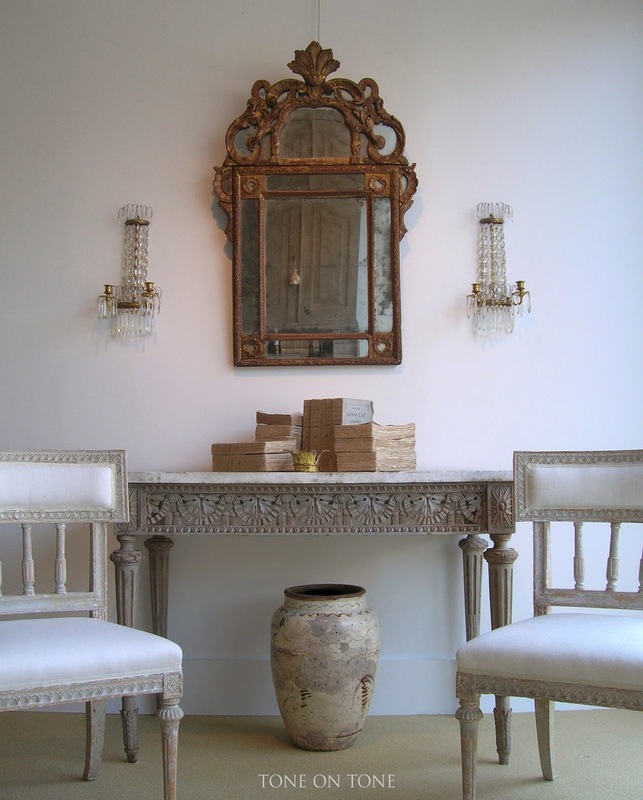 An antique French silver gilt mirror is flanked by sconces made from architectural elements. 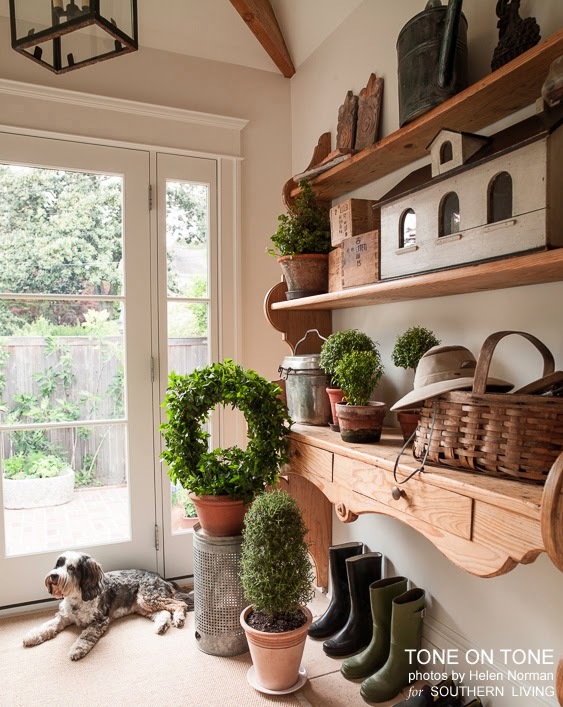 Finally, our sunny mudroom which we added during the renovation. Notice the abundance of natural light and airiness. Since there are two closets to the right, storage is not an issue here. 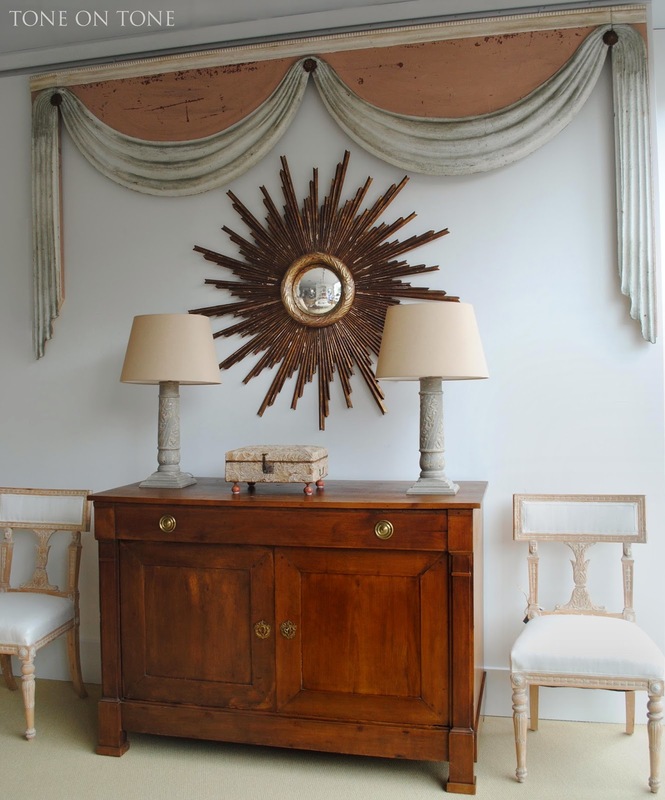 When I found this antique pine piece in France, I knew it would make an unusual but special focal point for this casual space. It's open shelves are decorative and sensible - no need for cumbersome doors. Also, vaulted ceilings with exposed beams give the room extra height and volume. I hope you've enjoyed our small spaces. Remember, a tiny room does have to be forgettable!! 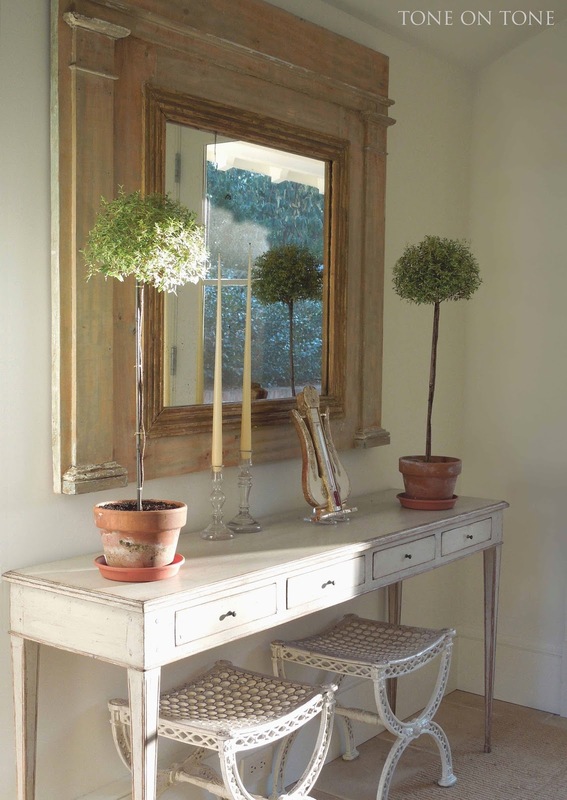 - Consider using antiques and vintage pieces as these are usually smaller. Plus, being one of a kind, they are sure to stand out. - Do include something larger, showy, or unexpected for scale and impact. - A table with legs allows a stool or two underneath, which can be pulled out for seating when needed. - When space is tight, try a pocket door. 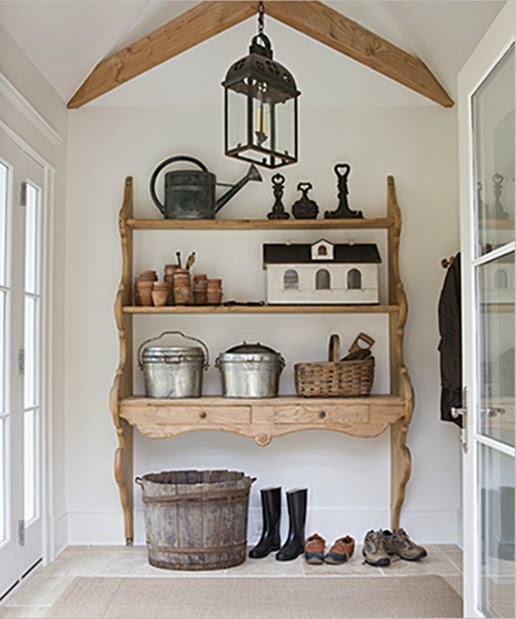 - Open shelves are airier and do not have cumbersome doors. - If you can't expand out, then go up. 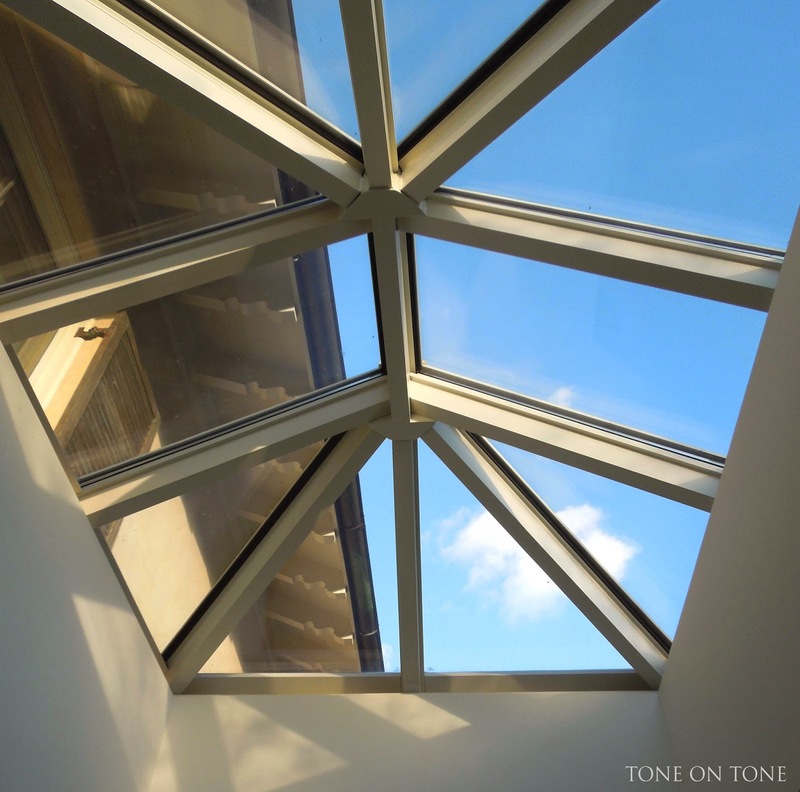 Add volume with vaulted ceilings. 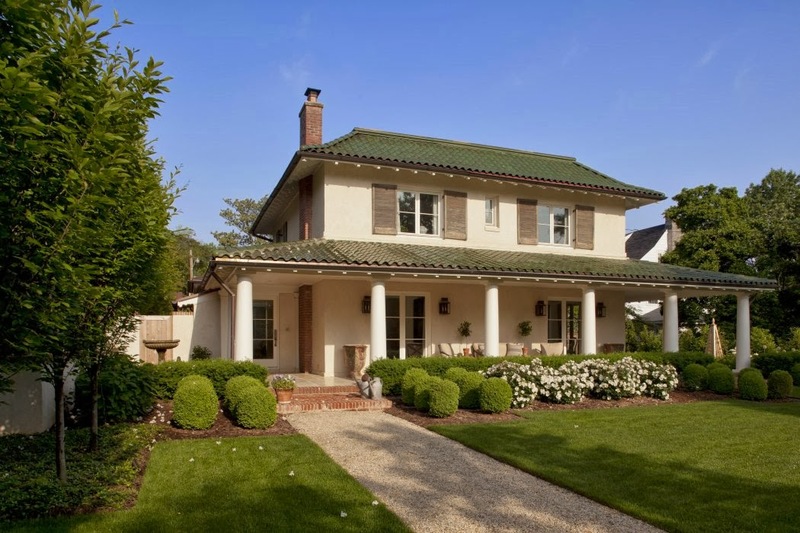 - Bring in more natural light with skylights, taller windows, cupolas, transoms, etc. Do you all love pillows as much as I do? 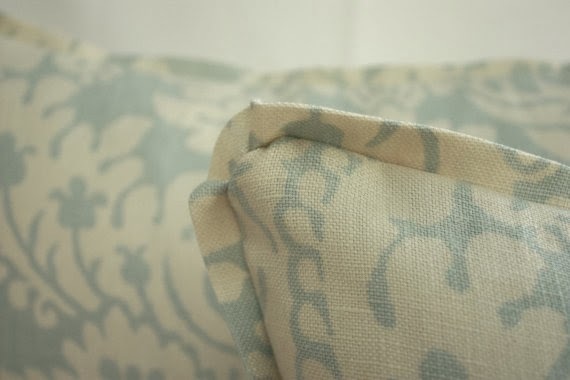 When a room starts looking tired, my quick fix is to tackle the pillows - either rearrange or, better yet, change them out! During this time of year, I really get the urge to freshen things up. 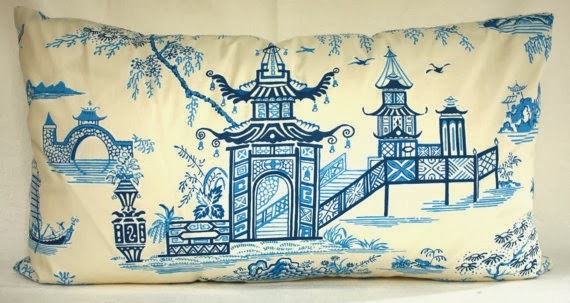 So I am always on the hunt for fabulous and one-off pillows. Please let me introduce one of my latest sources: 6 Wilson. 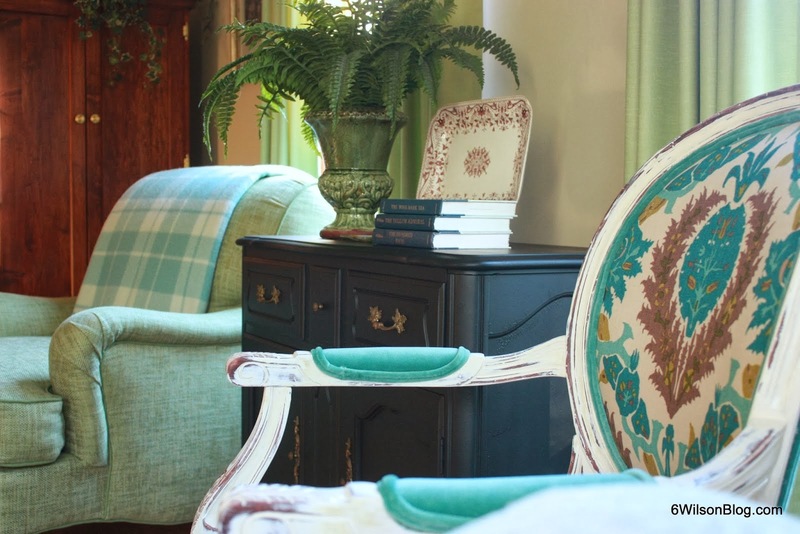 Founded by Interior Decorator Carol Beck, 6 Wilson is an online shop featuring vintage finds, gracious home accessories, and custom tailored pillows. You'll find classic, lovely offerings at reasonable prices. Oh, Carol is also a fellow blog author - enjoy her wonderful posts here! 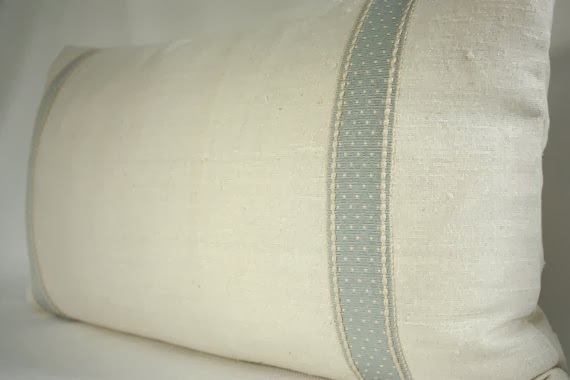 I couldn't resist this 14" x 36" blue-and-white lumbar from 6 Wilson. 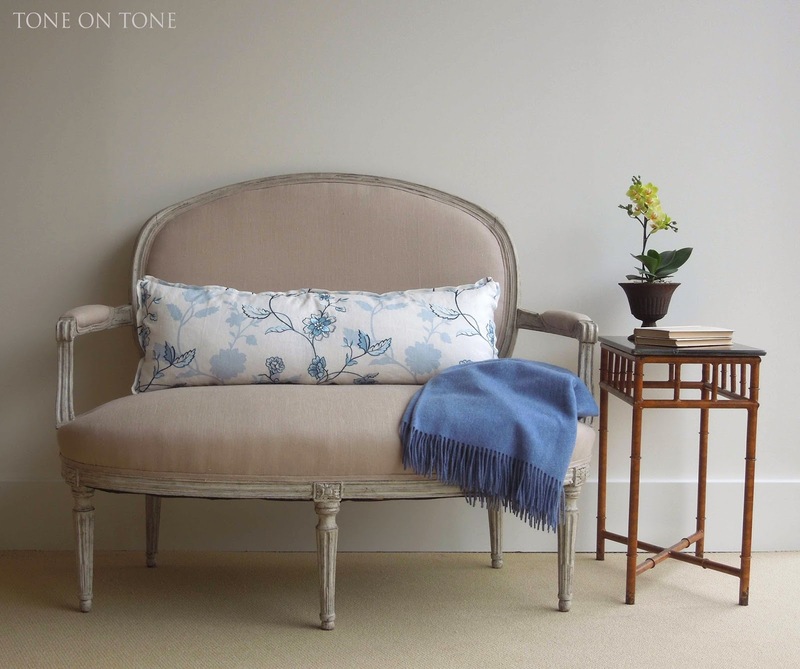 It looks great on the 19th century Swedish Gustavian painted settee at Tone on Tone. 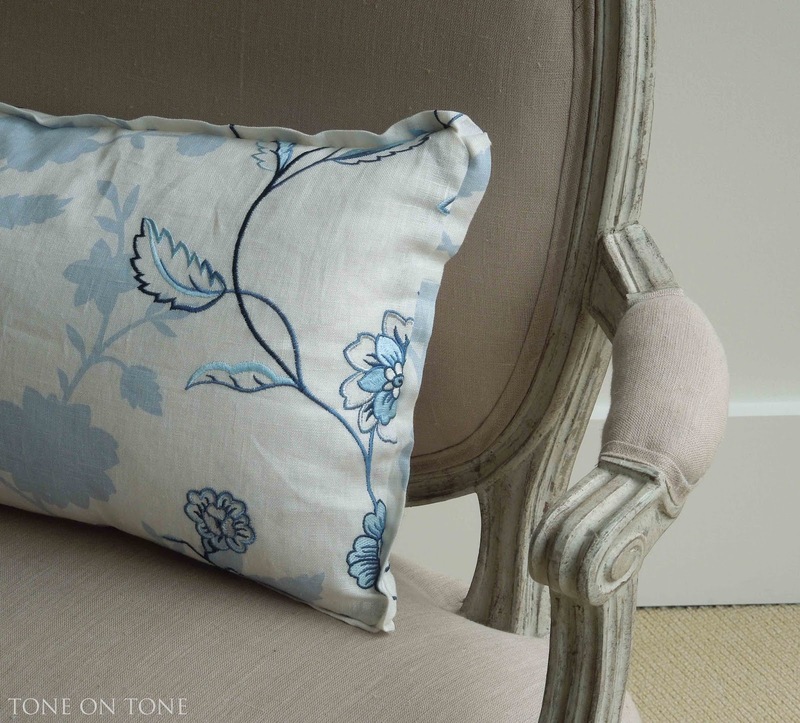 I am an Interior Decorator with 14 years in the field and a serious passion for fabric. And pillows. And great vintage finds. And, well, just about everything design. 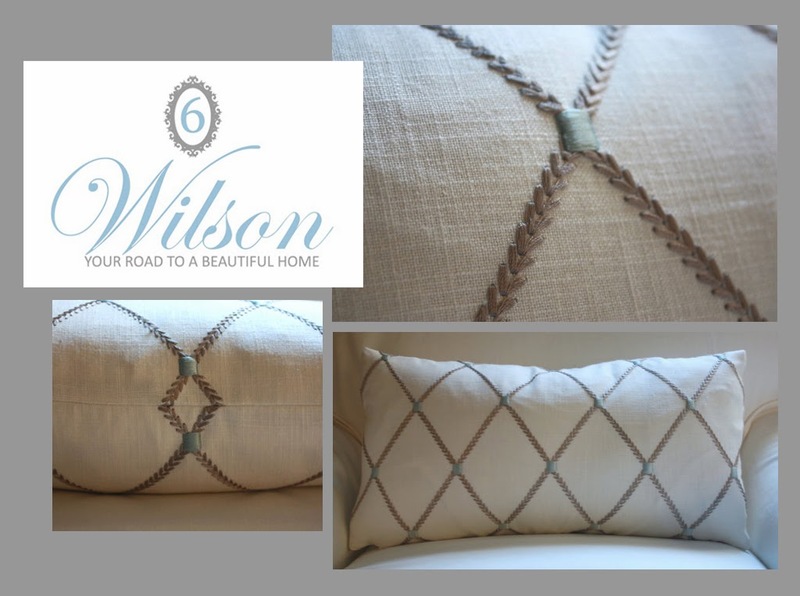 I'm truly obsessed with quality and detail, and with 6 Wilson -- Your Road to a Beautiful Home, my goal is to bring you statement fabrics and pieces at reasonable prices. These are just a few of my favorites from 6 Wilson -- all would be divine with Swedish style decor! 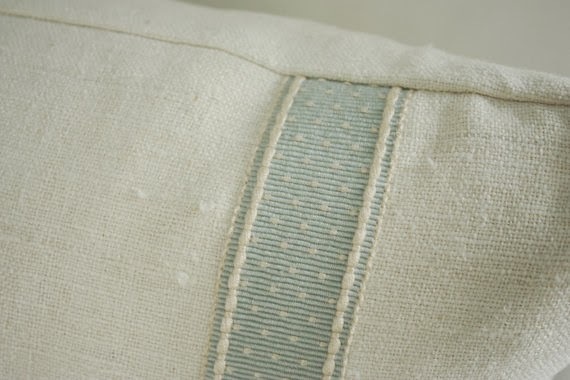 Lovely flange trim with subtle pleated corners. 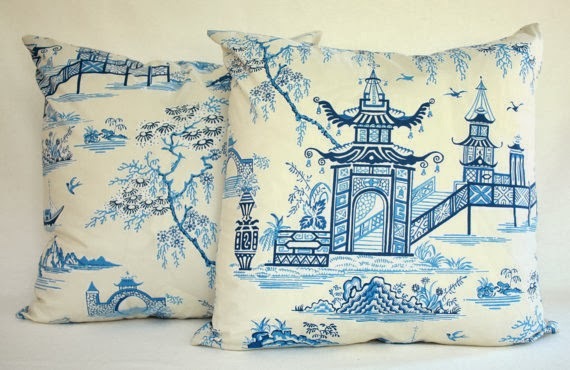 The classic Chinoiserie blue-and-white pagoda print: pretty, stylish, and perennially in vogue! 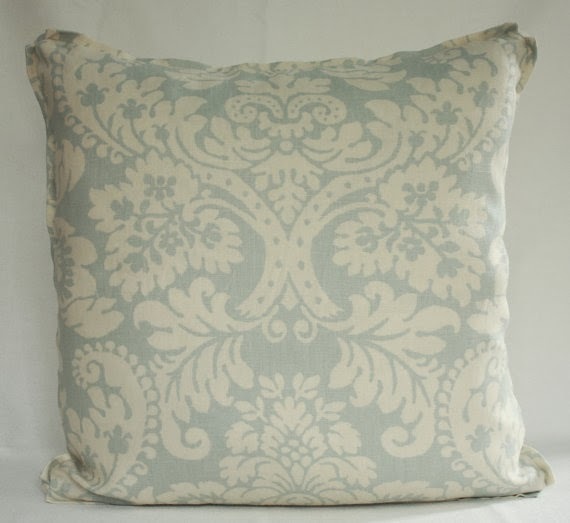 These pillows would look perfect in a pale blue bedroom. 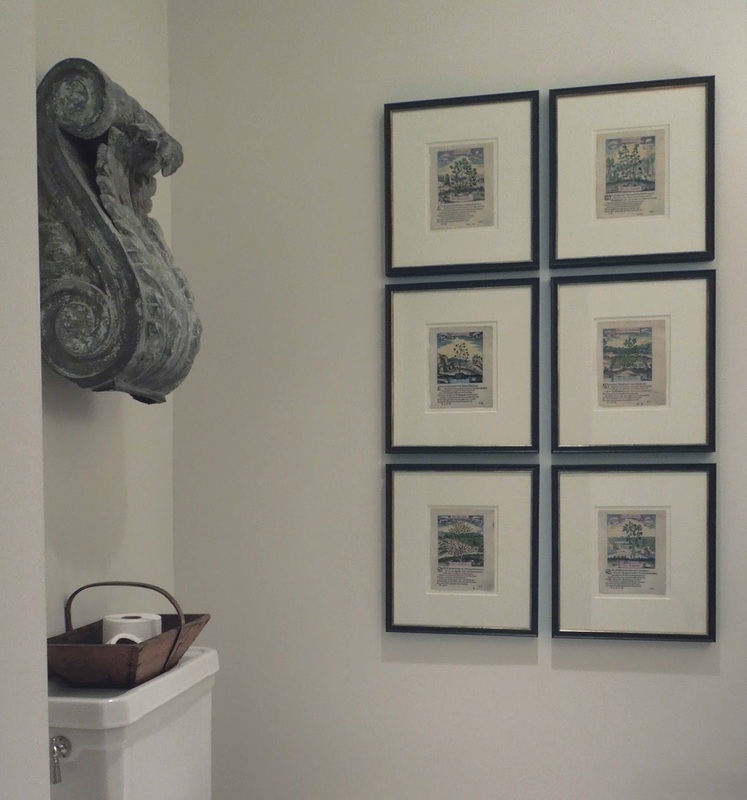 Or, use them to freshen up a wood-paneled library. And how about livening up a chocolate velvet sofa with them? Now a glimpse of Interior Decorator Carol Beck's beautiful home. I love the layering, depth, and mix of colors, patterns, and textures. 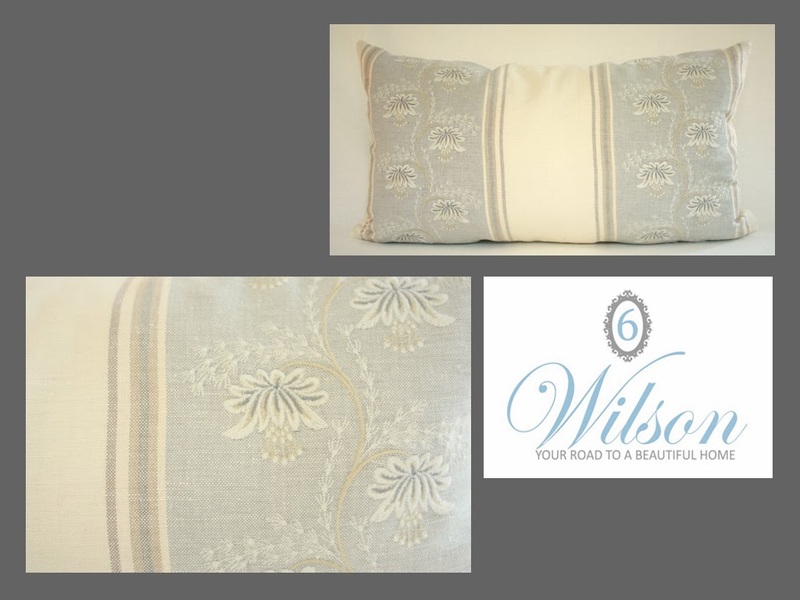 1) Visit 6 Wilson and look at the available pillows on the shop site. 3) If you are commenting anonymously, do include an email so I can contact you. 4) All are welcome, whether you have a blog or not - including readers outside the U.S.
5) This drawing starts on February 8 and ends on February 15, 2014 at 10:00 PM Eastern Time. One name (by comment #) will be drawn via Random.org. 6) I'll announce the winner on February 16, 2014. 7) Only one entry per person. In addition, Carol is offering a 20% discount off of items in her shop from now until February 16, 2014. Simply use coupon code TONEONTONE20 at checkout.